Following on from my Alphabet Project post, I created these little alphabet pebbles in lower case letters a-z. 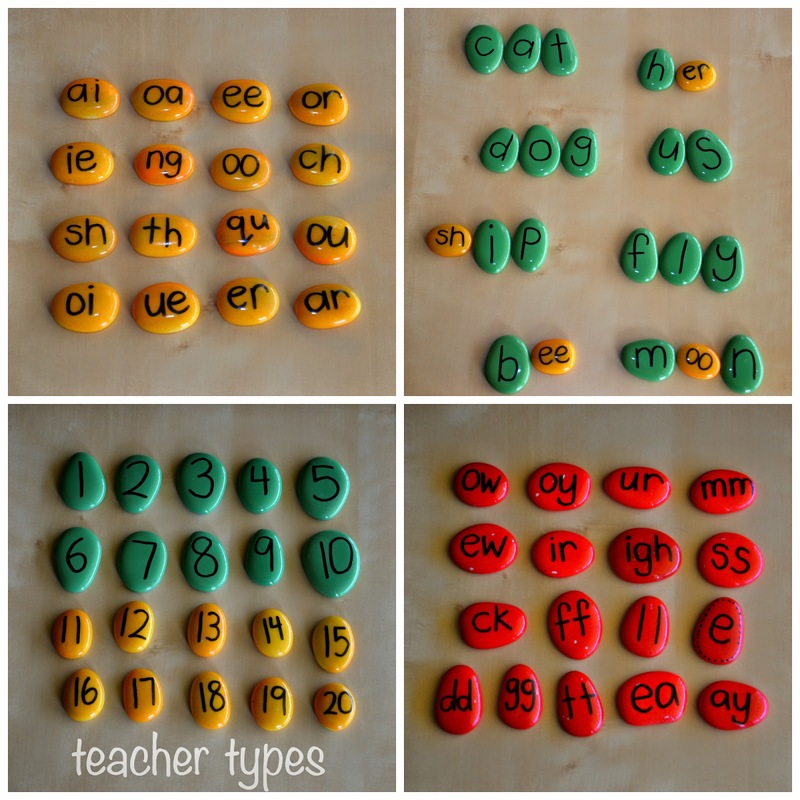 They will be great to use in the classroom for the kiddies to create simple three and four letter words. There is a significant step from when children have learnt the letters of the alphabet - to actually writing simple words. It's called word building. When using materials such as these pebbles, children do not need to remember how to write the letters, it's more about recognising the letters and putting them together to create words (mum, dad, cat, dog are great words to start with). As I've mentioned a few times before, my school applies the Jolly Phonics approach to teaching Literacy. At the core of Jolly Phonics is the notion that there are 42 sounds in the English language, many more than just the 26 letters of the alphabet. So as I got thinking about this project a little more, I then bought some extra pebbles in a different colour to include the additional two letter blends (eg sh, ch and th - see below). This opened up the possibilities for children to create many more words, and provided opportunities for extension. After trialling them in my classroom, we realised that words such as; will, duck, egg etc could be more effectively created with a third colour pebble for tricky and irregular sounds and blends. Then I got a bit excited and thought, why not make pebbles with numbers 1-20 on them as well? What a simple classroom resource! (By the way I bought them from Bunnings). Ask you child to "Get me a 2" or "Get me the letter m"
Sometimes by trying something new, using different 'hands-on' materials and changing it up a bit, you can motivate and encourage your child or students and inject something special into their day. these are cool as!! suddenly i think i need to go to bunnings! how are you using them with Miss M? What a great idea. I think it is great to mix up the learning to keep kids engaged. I think this is another weekend activity for us to try. Love it. Thanks for your comments ladies. Love the magnet idea Sarah Jensen. Thanks Sue! Great to hear. Glad you liked this post. Activities like these are definitely beneficial for children in the early stages of writing. Love this one! We will definitely do this. I'll get the kids to paint them and I'll write the numbers and letters. Love concrete learning. What fun! Where did you find the colored pebbles? Lauren, I have not heard of them (I am from Texas), though I am going to check them out online. Thanks!